This is an addenda to the old 855/955 Mobile Crane instructions, which I found at an eBay auction and won. It is a good example of a set that got some changes by LEGO, while selling on the market. Back to 1978, it was one of the most impressive sets at the time (and somehow still today in my opinion), together with other early TECHNIC sets (Branded Expert Builder Set in US, at the time). "It's a late version of the kit, with the additional parts to make the jib rest which was not on the original version. This is so the arm can be raised easily from the lowest position. The addendum to show this is on a separate sheet, later it was incorporated into the instructions. That makes this kit even rarer." "The gear racks are part of a translating rack assembly. A pair of pushrods connect the rack assembly to the boom. As the rack is translated aft, the pushrods drive the boom up. At the beginning of motion, the mechanical advantage is quite poor because the pushrods are almost parallel to the boom. For this reason, a lot of force is required at the crank to get things moving. Once the boom has been raised about 15 degrees, the crank turns easily." That might be the reason why LEGO later added a boom rest to this model. It would prevent the boom from going all the way down, making it easier to raise the boom by moving the correspondent wheel. At the time I found also a similar addenda with instructions modification for 853/956 (Car/Auto Chassis), which I wasn't able to find later anymore. It did relate with strengthen steering design, which breaks apart easily into early sets design. Apart that addenda, it is common to find different instructions books for this set, with differences on this matter (maybe a difference between USA and Europe building instructions. 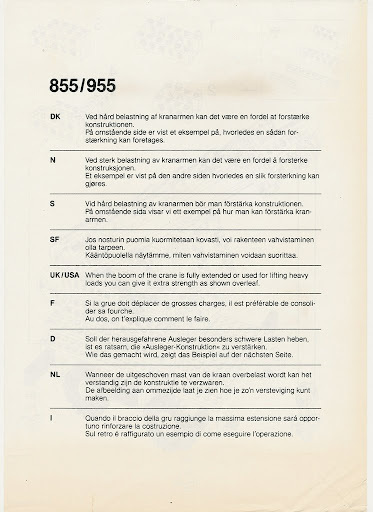 Fold-out poster format instructions were also used for Europe in the beginning, instead of more generally used book format). 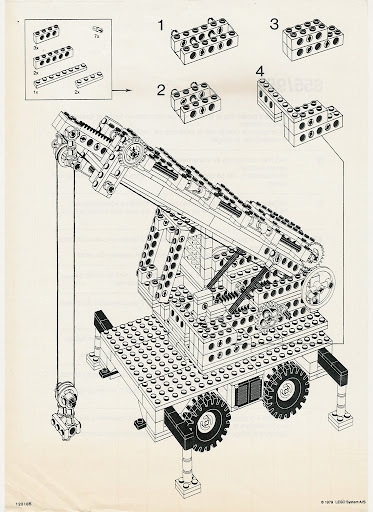 Several other TECHNIC sets are known to have suffered small changes while on the market (not to mention the re-editions), but usually it resumes to part variations (color and/or design), at least for those I remember. Eric, naturally you can also feel free to put this image into your 855/955 page at Technicopedia, to complement information about this model, if you wish. Thanks for this information. This "boom rest" seems to have been clearly designed to solve the mechanical advantage problem at the full down position. Presumably, LEGO also changed the parts list with later editions of this set to include the necessary parts. The same thing happened with the design change to the 851/952 tractor. The same happened more recently with the 8275 Motorized Bulldozer: my set came with a sheet drawing attention to the blade/forks problem some people had, and some people who were with me when I opened the box said that sheet wasn't present in their earlier sets.